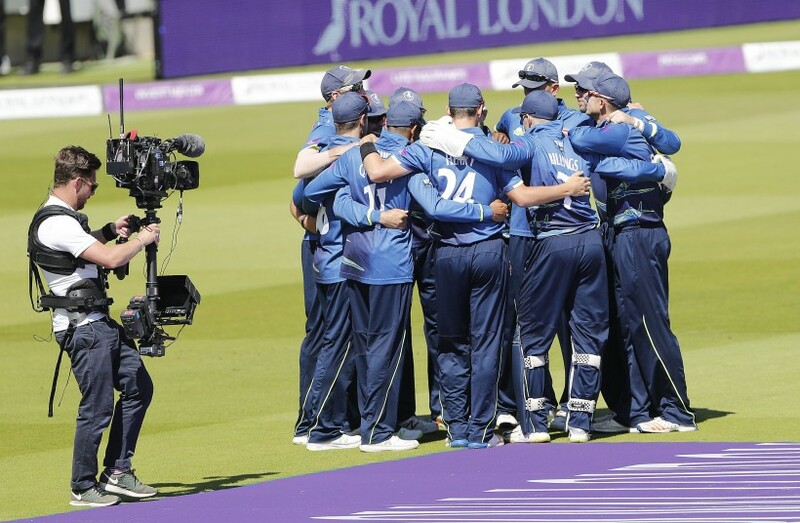 Kent Spitfires lost the Royal London One-Day Cup final against Hampshire in front of more than 20,000 at Lord’s. Joe Denly (4/57) and Imran Qayyum (2/60) restricted Hampshire to 330-7 before Daniel Bell-Drummond and Sam Billings scored half-centuries in reply. Former South Africa international Rilee Rossouw top-scored with 125 in an opening stand of 136 with Tom Alsop (72) before former skipper Sam Northeast saw Hampshire past 300 with an unbeaten 75. Qayyum got the first breakthrough as he beat Alsop in the flight and Billings completed a superb stumping. Hampshire skipper James Vince holed out to Denly in the deep for 23 for Qayyum’s second wicket. Denly was the pick of the attack as he extracted turn out of a fresh Lord’s pitch with Kent staring down the barrel as the South Group winners reached 262-2 off 40 overs. The Hampshire middle order had licence to attack from ball one and after Rossouw holed out to Blake, Denly collected three wickets in two overs as Dawson and McManus were caught in the deep by Blake and Dickson, who held out to a superb diving effort. He collected a fourth scalp when former Kent loan signing Joe Weatherley played around a lovely leg break to depart for a second-ball duck before Calum Haggett castled Gareth Berg in the final over. In reply, Bell-Drummond and Heino Kuhn put on 55 before the South African ran himself out attempting a single. Denly, fresh from his exploits with the ball, tried to play himself in before holing out to Vince for 12. Sean Dickson (30) helped steady the ship before he top-edged Mason Crane hitting against the spin. Bell-Drummond was unfortunate to fall 14 runs short of a sixth one-day hundred as his inside edged Chris Wood onto his stumps. Alex Blake arrived at the crease with 10 an over required and launched Liam Dawson over mid-wicket for six before being run out attempting a second run denied by the direct hit by Crane. Dawson struck when Darren Stevens was denied a fairytale third Lord’s final when he miscued a lofted drive to Joe Weatherley at mid-off. Requiring more than 11 an over, Henry holed out to Alsop off the bowling of Steyn before Sam Billings reached his 18th one-day 50 off 39 balls as kept losing partners at the other end. Haggett was ran out by a direct hit by Vince at the non-striker’s end before Billings holed out to end the chase. Kent Spitfires play Hampshire at home in the Vitality Blast at The County Ground, Beckenham on Friday 13 July.